Donegal Cattery – CFA registered Bicolors, Solids, Tabbies, & Himalayans; Chocolate & Lilac carriers for breeding. Riverbin – Beautiful Persians, Regional Winners and Grand Champion Lines. Healthy and loving Persians. 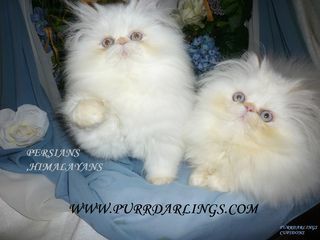 Sweetmist Persians – CFA cattery in Charlotte breeding healthy, happy solids, bi-colors, parti-colors for pet or show. TuffyTails Cattery – TuffyTails Cattery! Living Dolls of Fluff to Love.